Specifically designed for application developers and integrators, Oxygen XML SDK is the most comprehensive library for visual XML editing currently available on the market. Resulting from a continuous development effort of more than 10 years, Oxygen XML Editor has established itself as the leader in XML editing and fully supports all major XML standards. It is easy to understand why so many successful Content Management Systems in the XML editing field have selected Oxygen XML SDK as the base platform for all of their visual XML editing needs. Oxygen XML SDK is a Java library available under the Oxygen XML SDK licensing terms and is delivered with a set of examples that demonstrate how to extend Oxygen XML functionality through Application Programming Interface (API) calls. Please read the Frequently Asked Questions section for more details. Use the SDK to deploy the Oxygen Web Author Component on a server to provide functionality for visually editing and reviewing XML content on Web client devices. It combines the power of Oxygen XML Author and the versatility of HTML5. The SDK can be used to integrate the Oxygen Author Component into your own Java Swing applications. It was designed to provide functionality for authoring XML documents in a visual editor. Use the SDK to develop a custom framework (document type association) with custom actions and extensions for the Author visual editing mode in Oxygen XML Editor. Your customizations can then be shared with other members of your team. The SDK can be used to implement plugins for Oxygen XML standalone versions. These plugins can be used to add extra functionality to the interface, operations, or other components of Oxygen products using a series of application-provided extension points. This additional API is provided to allow you to easily access opened XML Editors from your own Eclipse plugins. You can check which pages are active in the opened XML editors, modify them, or add listeners to notify custom views that can provide additional context information. Use this API to implement support for an XProc engine that can be used from Oxygen to execute and possibly validate XProc pipelines. The development procedure is described in the user manual (please see the Integration of an external XProc engine - the XProc API section). Using SDK features, you can add XML editing capabilities to both standalone and web applications (on mobile devices or desktop browsers). You can leverage the XML frameworks or plugins already developed for Oxygen XML Author and deploy them in web applications with a high degree of compatibility, flexibility, and customization possibilities. Since the Oxygen SDK is based upon industry standards and popular technologies, it does not require users to learn proprietary languages, complicated tools, or special development environments. Extensive training is not necessary and most developers will feel comfortable using the API in a very short period of time. The Oxygen SDK is available as a set of Maven artifacts and the process of getting started is very simple. Archetypes are provided that can be used as a base to develop Oxygen frameworks, plugins, Eclipse integrations, and projects that use the Author or Web Author Component. If your build system is not based on Maven, you can use the JAR files from the SDK directly. The Oxygen XML SDK is designed to be upgrade-friendly as Syncro is committed to maintaining backward-compatible interfaces and strives to change the interfaces only when absolutely necessary. Very few code changes (if any) should be required when upgrading to a new version. 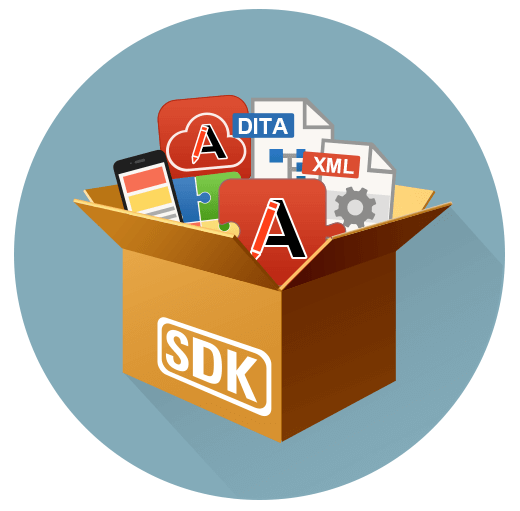 The Oxygen SDK is the most fully developed and comprehensive SDK on the market for adding XML authoring capabilities to your applications. Its architecture maintains a clear separation between core and user interface components, allowing developers to work directly with the same core that is used by Oxygen XML Editor. Syncro is committed to helping SDK developers drive the design, development, and deployment of applications by providing comprehensive technical support. You can view our SDK documentation, samples, and video presentations, check our Community Forum and Mailing List to find answers to many of your questions, or get specialized help from our dedicated support team.